UNISAN Pro Loop Web/Tailband Wet Mop Head, Cotton, 24oz, White, 12/Carton Four-ply premium yarn. Looped-end design for less lint, fraying and unraveling. Durable double-sewn tailband prevents tangles and provides more floor coverage. Heavy-duty polyester tape headband. Made from high-quality fiber. For general cleaning or floor finishing. Use with clamp-style mop handle (sold separately). 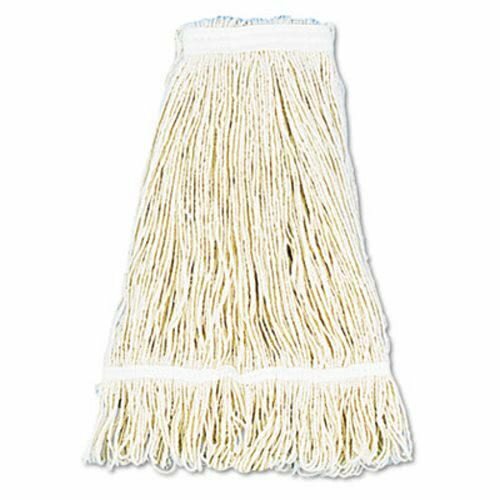 Head Type: Wet Mop; Application: Floors; Mop Head Style: Looped End; Mop Head Size: 24 oz. Durable double-sewn tailband prevents tangles and provides more floor coverage.